H585 LADDERS is a beautiful geometric design based upon an antique hooked rug purchased in New England. 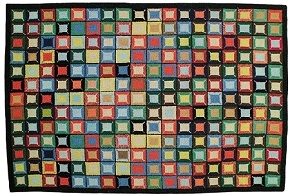 The design has a Navajo flavor to it, so it is possible that the Navajo rugs produced out West 100 years ago came from a suggested pattern from “Germantown Rugs”. 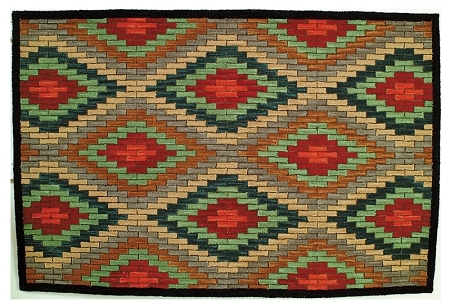 Produced during the late 1800’s were "Germantown" Navajo rugs woven from 3 ply or 4 ply machine spun wool yarn, usually on machine spun plied cotton warp. The name “Germantown” comes from the area near Philadelphia, Pa where much of the yarn is thought to have been produced. 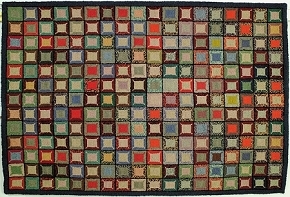 These Germantown rugs were intricately styled and very colorful.